This story, which you find on Wikipedia and elsewhere, isn't true: in 1896 the vaudeville performer, cartoonist, illustrator, and reporter J. Stuart Blackton interviewed Thomas Edison and was so inspired by Edison's movie studio that the following year he and his vaudeville partner, magician Albert Smith, started their own. The real story is better. In 1896 the Edison Manufacturing Company filmed a benefit where Blackton and Smith were performing. 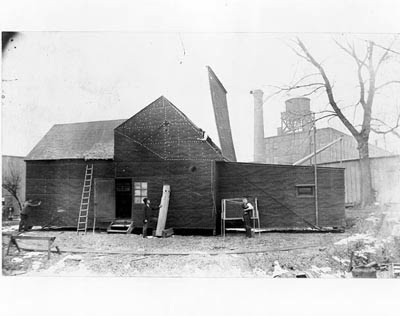 Blackton's part of the act—"lightning sketches," a popular stage entertainment—so impressed Edison's people that they hired him to repeat it in their Black Maria studio in West Orange, New Jersey. They had filmed many vaudevillians—acrobats, clowns, dancers—in the Black Maria, but Blackton was the only one who started his own movie studio: the American Vitagraph Company, co-founded with Smith in 1897. For two decades, before the rise of Hollywood in the 1920s, this Brooklyn-based company would be the most successful movie studio in the world. 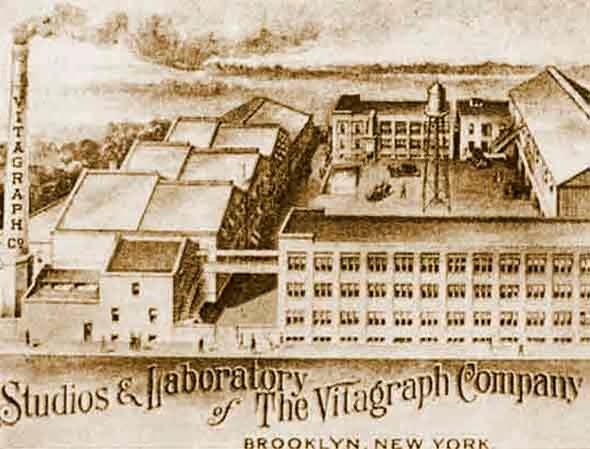 We can see how Vitagraph evolved from Blackton's vaudeville act when we compare the surviving footage of him at the Black Maria with Vitagraph's 1900 Enchanted Drawing, the oldest surviving animated film. The Enchanted Drawing is simply a lightning sketch brought to life with stop-motion photography. Watching this and other early films gives us a sense of the link between early cinema and the stage acts and illusions that preceded it. Georges Méliès's films, for example, often look like magic shows, with the former magician making people and things appear and disappear more easily than was possible on stage. The stop-motion effects in these films may strike today's viewers as hokey and unconvincing, but they dazzled the original audiences. As I've described elsewhere, simply projecting moving images on a screen was often enough to entertain early moviegoers. In their vaudeville act, Blackton and Smith had used a magic lantern, a primitive slide projector, to project images on a screen—now they could make those images move. Their early films included a prizefight, recreated scenes of a hotel fire and the Spanish-American war, the aftermath of the 1900 Galveston hurricane and 1906 San Francisco earthquake, and an airplane flight over New York. They also filmed numerous comic pantomimes. 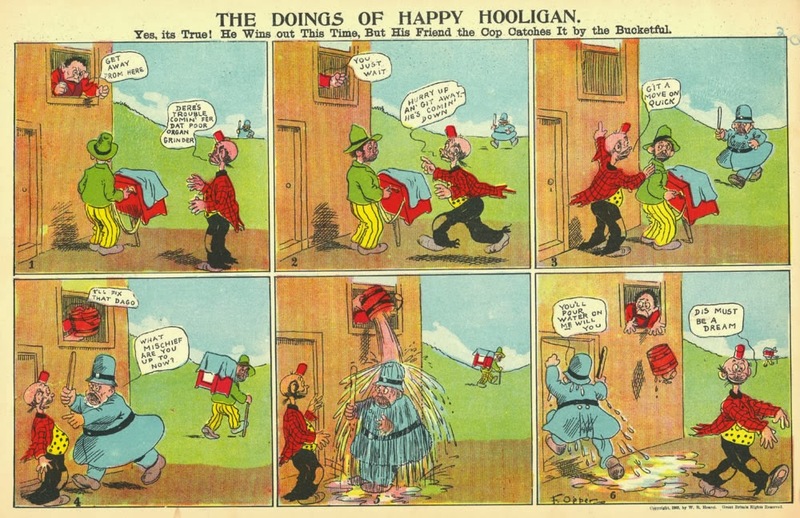 Blackton himself starred in a series of these, based on Happy Hooligan, one of the early twentieth-century's most popular cartoons. The character's last name, which predated the cartoon in a popular song, has survived as part of the language, as has the name of another character—"Gloomy Gus." While the Hooligan films adhered closely to their printed source—compare the comic and film above—most other Vitagraph pantomimes were versions of the slapstick skits that were a staple of the vaudeville stage. When Vitagraph attempted more sophisticated drama, Shakespeare was their main source. In 1908 they made versions of Othello, Macbeth, Romeo and Juliet, Julius Caesar, The Merchant of Venice, and Antony and Cleopatra, the latter featuring the "Biograph Girl," Florence Lawrence, sometimes called the first movie star. The following year they filmed King Lear and A Midsummer Night's Dream, and in 1910 their Twelfth Night starred Lawrence's rival, "Vitagraph Girl" Florence Turner. In 1912, they filmed As You Like It and "Cardinal Wolsey," which was based on Henry VIII. Except for Othello, which may have been beaten by a German film, and Romeo and Juliet, which was beaten by an English film, each of these Vitagraph productions was the first movie version of its play. That's nine "firsts" in all, a record no studio has come close to topping.